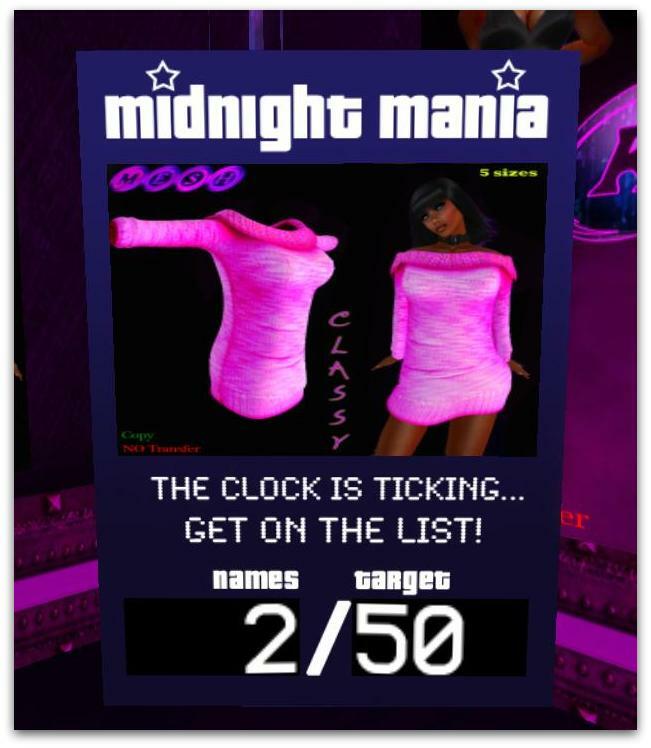 As always, there’s lots of Midnight Mania’s to hit up, but if you were looking for a great variety of gifts, then check out KzD’sign. There you can find clothes, a pair of boots, a skin and a complete avatar in their upstairs – all needing 49 -59 hits. You can also find Lucky Letter chairs with more outfits ready to be won (6 in all). And be sure to head downstairs where one more MM board has a version of one of their latest mesh releases called Classy. It comes in 5 sizes and with only 50 slaps needed for lock down, you’ll want to act quick! Plus, it’s free to hit any of these boards. p.s. – I recently found out about this store by seeing the owner wearing her color-changing mesh clothes! Find more about that on my post here. /me shouts with excitement…Curio and it’s creator, Gala Phoenix, are officially back in business!! And back she is with a bang. Join the group for free right now and check the group notices to get a boatttttttttload of the Party Girl Curio skinline in every shade and makeup option! AND! I’m soo excited about this store called [ S H O C K ]! I first visited their stall at the Swag Fest 2012 event (still going on, details here) and just had to visit their mainstore. To my surprise there were lots of group gifts up for grabs! The group is free to join and there you can find the Sandy and Kisha skins shown above *plus* these nails featuring Halloween and the Dias De Los Muertos themes!! The clothing I am wearing is not free, however, the $L do go toward a great cause. 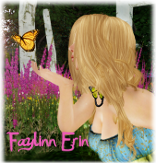 It is from the One Voice fundraiser event to help the RL maker of Curio skins, Gala Phoenix. She is currently in a legal battle with owner of Hush skins, and is fighting for her creative rights for her skin. This is huge because, as many designers feel, it is important to protect creative content in Second Life. So you can find many of the grid’s best designers there, showing their support, 50-100% of the proceeds goes to Gala’s defense fund. You can read more about it & hear from Gala herself here or TP now to One Voice. Riddle just sent out a group gift of their Smexy Shoulders top in yellow and pink. I’m wearing the pink one below. Go to Riddle, join the update group in store, and check messages, it’s in the message dated 19 Dec 10. These are perfect on their own, and also great for layering! By the way, see the eyes that I’m wearing? They are from Insufferable Dastard, which has a retirement sale going on until 12/23! There was a lot of info in the notecard so I tinypasted all of that for you here. They sell skins, eyes, tattoo makeup, and more. I’m sorry I’ve not posted in a while; if you know me from Perfectly-x-imperfect you’d know that my graphics card has died; ect ect! Picture taking has been a no no! However, I’m still looking out for freebies and taking pictures when I can. But, I digress; There is an awesome little hunt going on at the moment called: Sucker for hunts. This beautiful dress is No.40 in the hunt and can be found at ‘Formal and Fantasy clothes‘. I really love it!